"Dancing Waters Lodge" was featured in Blue Ridge Country Magazine in 'Great Mountain Homes on the water' article dated August 2014. 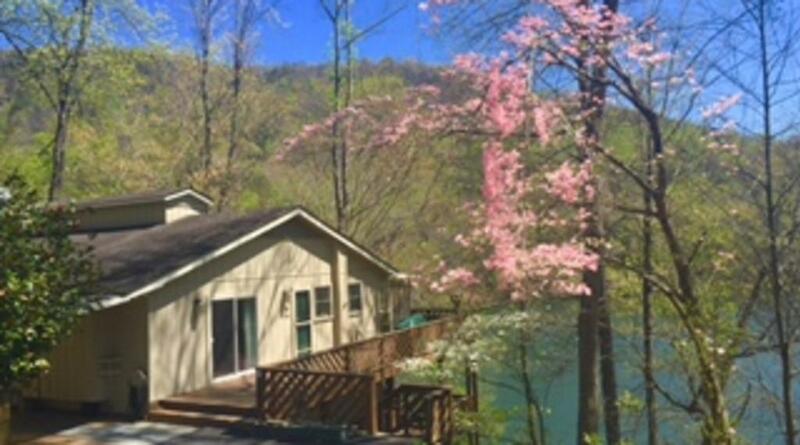 “Dancing Waters Lodge” is the perfect Mountain Lakeside Home. 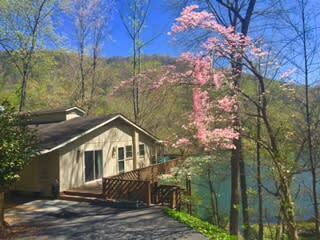 This home is located within Rumbling Bald Resort on Bald Mountain Lake, with a short walk to the amenities. The house has so much to offer, 5 bedrooms, each bedroom has a view of the lake with sliding glass doors to decks. (10 people in beds with 1 air mattress) and 3.5 baths on two levels. On the main level you have an open floor plan. The kitchen opens straight into the great room, screened in porch and large deck space. The great room/dining area has plenty of room for 8 with room for 4 to sit at the kitchen bar. The great room has a TV and gas fireplace. The master bedroom is located on the main level with a private bath. A second bedroom which is perfect for kids is also on the main level. Just off the kitchen is a half bath. Enjoy your morning coffee while watching all the wildlife on the screened in porch. Located on the lower level are 3 bedrooms and 2 full baths. One of the bathrooms has an exit door to the back deck. The lower level great room has room to watch TV, play board games and enjoy your family and friends. Walk out from the great room to a large deck area. From the deck you can make your way down 44 steps to the beautiful clear Lake of Bald Mountain. The home provides 1 canoe, paddle boat and 4 kayaks.There is a floating dock for your use. There is also seating on the dock but you might want to bring extra chairs to take to the beach on Lake Lure. Don't forget your fishing poles; you just might catch the trophy bass of the resort.